Glyphipterigidae is a small group in North America. The Nearctic fauna was treated by Heppner (1985). Four species, representing three genera, are known from Illinois. These fall out into two groups. Two of the species (Abrenthia cuprea and Glyphipterix quadragintapunctata) are relatively large glyphipterigids, with broad wings; the larvae of these species probably feed on dicots, but neither has been reared. The other two species (Glyphipterix circumscriptella and Diploschizia impigritella) are relatively small, narrow-winged brown moths with silvery-white and metallic markings; the larvae of these species are believed or known to be borers in sedges (Cyperaceae). Abrenthia cuprea (Fig. 1) is rarely collected. It is known only from the adult stage. It appears to be univoltine and has been collected at light in Illinois in mid- to late June. The only recent sighting of this moth was by James Durbin, who observed and photographed a live adult at light in Iowa on 30 June, 2011. Figure 1. Abrenthia cuprea. Left panel, spread adult, collected at UV light; right panel, live adult, photographed in Iowa, 30 June, 2011, by James Durbin, who generously provided this image. Glyphipterix quadragintapunctata (Fig. 2) is seldom collected at light, but it can be common during the day in localized areas where populations occur. There is one generation per year, with adults appearing during the first two weeks of June in central Illinois. 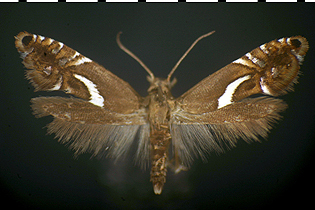 The moth occurs in low, shaded deciduous forest; it sits preferentially on the upperside of the leaf of stinging nettle, Urtica dioica (Urticaceae), which probably is the larval foodplant. Figure 2. Glyphipterix quadragintapunctata. Adult. Left, spread specimen; right, live adult on stinging nettle, Urtica dioica (Urticaceae). 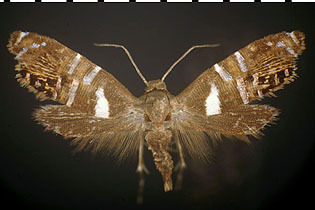 Glyphipterix circumscriptella (Fig. 3) is a diurnal moth that sometimes can be collected on flowers at the edges between forest and open areas, throughout the month of June. Figure 3. Glyphipterix circumscriptella. Adult, collected diurnally on flower of fleabane, Erigeron sp. (Asteraceae). Diploschizia impigritella (Fig. 4) feeds as a larva in sedges of the genus Cyperus (Cyperaceae). This is the only Illinois glyphipterigid that appears frequently at light. It undergoes multiple generations per year; collection dates for adults range from early May through early November, with a concentration in the warmer months. Figure 4. Diploschizia impigritella. Adult, collected at UV light.